The Lumière (pronounced: [lymjɛːʁ]) brothers, Auguste Marie Louis Nicolas [oɡyst maʁi lwi nikɔla] (19 October 1862, Besançon, France – 10 April 1954, Lyon) and Louis Jean [lwi ʒɑ̃] (5 October 1864, Besançon, France – 6 June 1948, Bandol), were among the first filmmakers in history. They patented the cinematograph, which in contrast to Edison's "peepshow" kinetoscope allowed simultaneous viewing by multiple parties. The Lumière brothers were born in Besançon, France to Charles-Antoine Lumière (1840-1911) and Jeanne Joséphine Costille Lumière, who were married in 1861 and moved to Besançon, setting up a small photographic portrait studio where Auguste and Louis were born. They moved to Lyon in 1870, where son Edouard and three daughters were born. Auguste and Louis both attended La Martiniere, the largest technical school in Lyon. Their father Charles-Antoine set up a small factory producing photographic plates, but even with Louis and a young sister working from 5 a.m. to 11 p.m. it teetered on the verge of bankruptcy, and by 1882 it looked as if they would fail, but when Auguste returned from military service the boys designed the machines necessary to automate their father's plate production and devised a very successful new photo plate, 'etiquettes bleue', and by 1884 the factory employed a dozen workers. It was not until their father retired in 1892 that the brothers began to create moving pictures. They patented a number of significant processes leading up to their film camera, most notably film perforations (originally implemented by Emile Reynaud) as a means of advancing the film through the camera and projector. The original cinématographe had been patented by Léon Guillaume Bouly on 12 February 1892. The brothers patented their own version on 13 February 1895. The first footage ever to be recorded using it was recorded on March 19, 1895. This first film shows workers leaving the Lumière factory. The Lumières brothers saw film as a novelty and had withdrawn from the film business in 1905. They went on to develop the first practical photographic color process, the Lumière Autochrome. 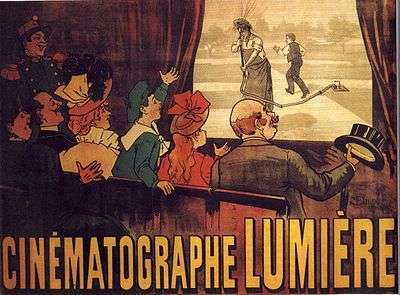 The Lumières held their first private screening of projected motion pictures in 1895. The American Woodville Latham had screened works of film seven months earlier. The first public screening of films at which admission was charged was a program by the Skladanowsky brothers that was held on November 1, 1895, in Berlin. The Lumières gave their first paid public screening on December 28, 1895, at Salon Indien du Grand Café in Paris. This history-making presentation featured ten short films, including their first film, Sortie des Usines Lumière à Lyon (Workers Leaving the Lumière Factory). Each film is 17 meters long, which, when hand cranked through a projector, runs approximately 50 seconds. It is believed their first film was actually recorded that same year (1895) with Léon Bouly's cinématographe device, which was patented the previous year. 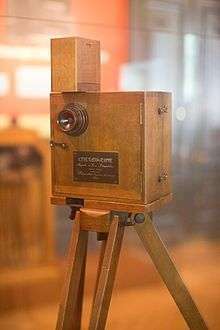 The cinématographe — a three-in-one device that could record, develop, and project motion pictures — was further developed by the Lumières. The Lumières went on tour with the cinématographe in 1896, visiting Brussels (the first place a movie was played outside Paris on the Galleries Saint-Hubert on March 1. 1896), Bombay, London, Montreal, New York City and Buenos Aires. The moving images had an immediate and significant influence on popular culture with L'Arrivée d'un Train en Gare de la Ciotat (literally, "the arrival of a train at La Ciotat", but more commonly known as Arrival of a Train at a Station) and Carmaux, défournage du coke (Drawing out the coke). Their actuality films, or actualités, are often cited as the first, primitive documentaries. They also made the first steps towards comedy film with the slapstick of L'Arroseur Arrosé. 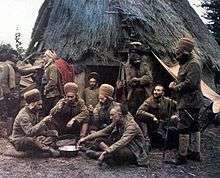 Autochrome color picture by Jean-Baptiste Tournassoud of North-African soldiers, Oise, France, 1917. The brothers stated that "the cinema is an invention without any future" and declined to sell their camera to other filmmakers such as Georges Méliès. This made many film makers upset. Consequently, their role in the history of film was exceedingly brief. In parallel with their cinema work they experimented with colour photography. They worked on a number of colour photographic processes in the 1890s including the Lippmann process (interference heliochromy) and their own 'bichromated glue' process, a subtractive colour process, examples of which were exhibited at the Exposition Universelle in Paris in 1900. This last process was commercialised by the Lumieres but commercial success had to wait for their next colour process. In 1903 they patented a colour photographic process, the Autochrome Lumière, which was launched on the market in 1907. Throughout much of the 20th century, the Lumière company was a major producer of photographic products in Europe, but the brand name, Lumière, disappeared from the marketplace following merger with Ilford. They also invented the color plate which really got photography on the road. The Lumière Brothers were not the only ones to claim the title of the first cinematographers. The scientific chronophotography devices developed by Eadweard Muybridge, Étienne-Jules Marey and Ottomar Anschütz in the 1880s were able to produce moving photographs, as was William Friese-Greene's 'chronophotographic' system, demonstrated in 1890, and Thomas Edison's Kinetoscope (developed by W K-L Dickson), premiered in 1891. Since 1892, the projected drawings of Émile Reynaud's Théâtre Optique were attracting Paris crowds to the Musée Grévin. Louis Le Prince and Claude Mechant had been shooting moving picture sequences on paper film as soon as 1888, but had never performed a public demonstration. Polish inventor, Kazimierz Prószyński had built his camera and projecting device, called Pleograph, in 1894. Max and Emil Skladanowsky, inventors of the Bioscop, had offered projected moving images to a paying public one month earlier (November 1, 1895, in Berlin). Nevertheless, film historians consider the Grand Café screening to be the true birth of the cinema as a commercial medium, because the Skladanowsky brothers' screening used an extremely impractical dual system motion picture projector that was immediately supplanted by the Lumiere cinematographe. Although the Lumière brothers were not the first inventors to develop techniques to create motion pictures, they are often credited as among the first inventors of the technology for Cinema as a mass medium, and are among the first who understood how to use it. 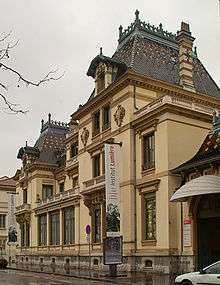 Their house in Lyon, France, is now the Institut Lumière museum. L'Idéal Cinéma Jacques Tati in Aniche the oldest still-active cinéma in the world, though not continuously, since November 23, 1905. ↑ "Louis Lumière, 83, A Screen Pioneer. Credited in France With The Invention of Motion Picture.". New York Times. 7 June 1948. Retrieved 2008-04-29. ↑ "Died.". Time (magazine). 14 June 1948. Retrieved 2008-04-29. 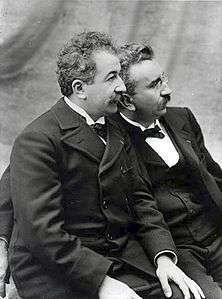 Louis Lumière, 83, wealthy motion-picture and color-photography pioneer, whom (with his brother Auguste) Europeans generally credit with inventing the cinema; of a heart ailment; in Bandol, France. ↑ "Brevet FR 219.350". Cinematographes. Retrieved 2013-12-11. ↑ "Brevet FR 245.032". Cinematographes. Retrieved 2013-12-11. ↑ Chardère (1985), p.71. This first screening on March 22, 1895 took place in Paris, at the "Society for the Development of the National Industry", in front of an audience of 200 people – among which Léon Gaumont, then director of the Comptoir de la photographie. The main focus of this conference by Louis Lumière were the recent developments in the photograph industry, mainly the research on polychromy (color photography). It was much to Lumière's surprise that the moving black-and-white images retained more attention than the colored stills photographs. ↑ "La première séance publique payante", Institut Lumière Archived September 12, 2005, at the Wayback Machine. ↑ Chardère (1987), p.70: The date of the recording of their first film is in dispute. In an interview with Georges Sadoul given in 1948, Louis Lumière tells that he shot the film in August 1894. This is questioned by historians (Sadoul, Pinel, Chardère) who consider that a functional Lumière camera didn't exist before the end of 1894, and that their first film was recorded March 19th 1895, and then publicly projected March 22nd at the Société d'encouragement pour l'industrie nationale in Paris. ↑ Bienvenue sur Adobe GoLive 4 Archived September 12, 2005, at the Wayback Machine.. Institut-lumiere.org. Retrieved on 2013-08-16. Chardère, B.; Borgé, G.; Borge, M. (1985). Les Lumière (in French). Paris: Bibliothèque des Arts. ISBN 2-85047-068-6. Cook, David (2004). A History of Narrative Film (4th ed.). New York: W. W. Norton. ISBN 0-393-97868-0. Mast, Gerald; Bruce F. Kawin (2006). A Short History of the Movies (9th ed.). New York: Pearson Longman. ISBN 0-321-26232-8. Rittaud-Hutinet, Jacques (1985). Le cinéma des origines (in French). Seyssel: Champ Vallon. ISBN 2-903528-43-8. Wikimedia Commons has media related to Frères Lumière. The films shown at the first public screening (QuickTime format) — December 28, 1895. Also includes a program for the event.